Tuesday mornings 10.30am-1.30pm | 27th Feb - 17th Apr (No Class 3rd April) | £25 drop in session Expect excellent models, fully tutored sessions with poses ranging from 3 mins. to 1 hour. Both courses include one Portraiture session. 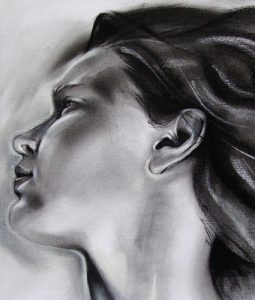 You will be working in Mixed Media – Charcoal, Pastel, Ink and Watercolour Perfect for beginners or those with some experience. There will be plenty of demonstrations and one to one tuition throughout. Tuesday mornings 10.30am-1.30pm | 24th Apr - 5th June (No Class 29th May) | £130 or £25 drop in session Expect excellent models, fully tutored sessions with poses ranging from 3 mins. to 1 hour. Both courses include one Portraiture session. 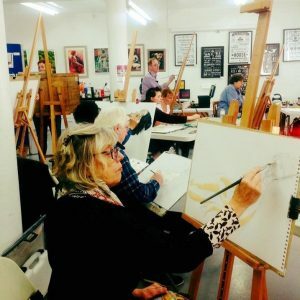 You will be working in Mixed Media – Charcoal, Pastel, Ink and Watercolour Perfect for beginners or those with some experience. There will be plenty of demonstrations and one to one tuition throughout. Tuesday mornings 10.30am-1.30pm | 19th Jun - 24th Jul | £130 or £25 drop in session Expect excellent models, fully tutored sessions with poses ranging from 3 mins. to 1 hour. Both courses include one Portraiture session. You will be working in Mixed Media – Charcoal, Pastel, Ink and Watercolour Perfect for beginners or those with some experience. There will be plenty of demonstrations and one to one tuition throughout. Tuesday mornings 10.30am-1.30pm | 4th Sep - 9th Oct | £130 or £25 drop in session | Includes all materials and model fees Expect excellent models, fully tutored sessions with poses ranging from 3 mins. to 1 hour. Both courses include one Portraiture session. You will be working in Mixed Media – Charcoal, Pastel, Ink and Watercolour Perfect for beginners or those with some experience. There will be plenty of demonstrations and one to one tuition throughout. Thursday evenings 7.00pm-9.30pm | 6th Sep - 11th Oct | £130 or £25 drop in session | Includes all materials and model fees Expect excellent models, fully tutored sessions with poses ranging from 3 mins. to 1 hour. Both courses include one Portraiture session. You will be working in Mixed Media – Charcoal, Pastel, Ink and Watercolour Perfect for beginners or those with some experience. There will be plenty of demonstrations and one to one tuition throughout. Tuesday mornings 10.30am-1.30pm | 16th Oct - 27th Nov (not 23rd Oct)| £130 or £25 drop in session | Includes all materials and model fees Expect excellent models, fully tutored sessions with poses ranging from 3 mins. to 1 hour. Both courses include one Portraiture session. You will be working in Mixed Media – Charcoal, Pastel, Ink and Watercolour Perfect for beginners or those with some experience. There will be plenty of demonstrations and one to one tuition throughout. Tuesday mornings 10.30am-1.30pm | 22nd Jan - 5th Mar (not 19th Feb)| £130 or £25 drop in session | Includes all materials and model fees Expect excellent models, fully tutored sessions with poses ranging from 3 mins. to 1 hour. Both courses include one Portraiture session. 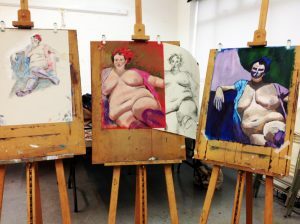 You will be working in Mixed Media – Charcoal, Pastel, Ink and Watercolour Perfect for beginners or those with some experience. There will be plenty of demonstrations and one to one tuition throughout. Tuesday mornings 10.30am-1.30pm | 12th Mar - 23rd Apr (not 16th Apr)| £130 or £25 drop in session | Includes all materials and model fees Expect excellent models, fully tutored sessions with poses ranging from 3 mins. to 1 hour. Both courses include one Portraiture session. You will be working in Mixed Media – Charcoal, Pastel, Ink and Watercolour Perfect for beginners or those with some experience. There will be plenty of demonstrations and one to one tuition throughout.